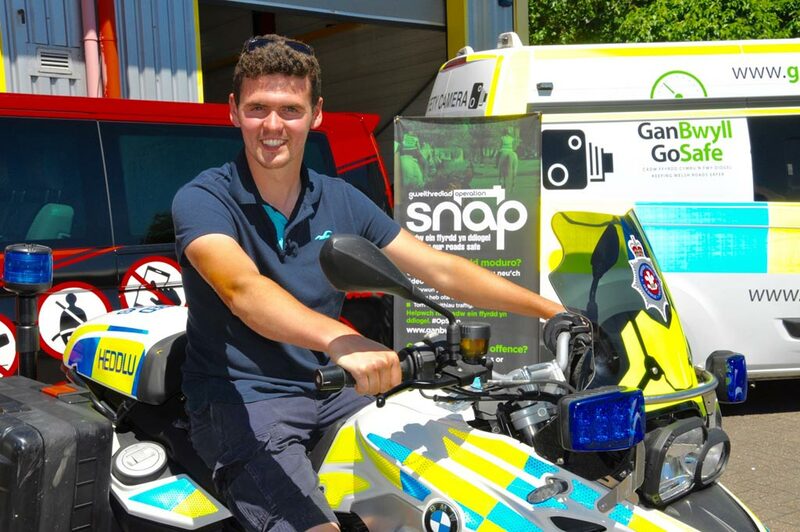 Osian Pryce has backed the ‘GoSafe – the Wales Road Casualty Reduction Partnership’ Operation SNAP initiative, after seeing for himself some of the crazy and irresponsible driving that members of the public have captured and sent into the Dyfed-Powys Police Road Safety unit. Osian attended a media event at the GoSafe Partnership headquarters, were as well as being interviewed by journalists, he was given exclusive access behind the scenes. Operation SNAP is a response to increasing submissions of video and photographic evidence relating to driving offences that members of the public have witnessed and captured on their dash cams, or from the side of the road on their mobile ‘phones. They can take that digital footage and upload it onto gosafe.org, which is an effective and efficient way of reporting and dealing with motoring offences. In numerous cases, this footage has seen unfit drivers surrender their licence voluntarily or prosecuted and taken off the road – making the roads of Wales safer for us all.